I was in Middleburg, Virginia recently in the heart of Loudoun County, probably the best wine-tourism area in the mid-Atlantic region (more about the wines soon). 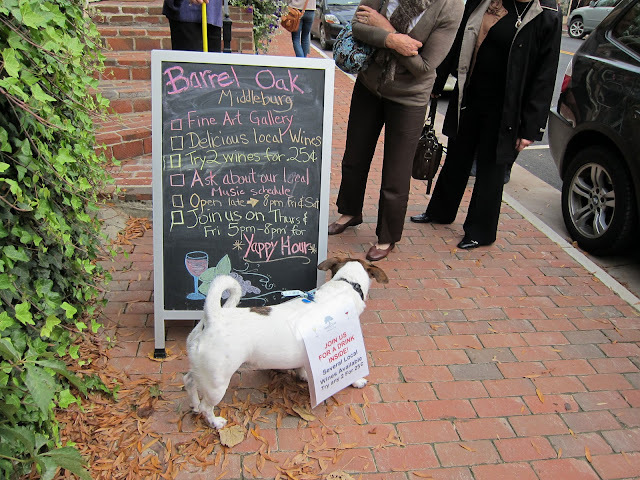 I had just had lunch at the ancient Red Fox Inn -- built in 1728, the peanut soup is still a keeper -- when I passed this dog on the street advertising a tasting room. The dog seemed to enjoy the work; it paraded up and down the sidewalk carrying the sign. It got my attention: I shot about a dozen photos. But it didn't actually draw me into the tasting room, so maybe it wasn't that effective. However, when you consider this employee was probably paid in dried liver treats, and requires no health insurance, you can see the potential. No wonder the wines are only 13 cents per taste; minimal labor costs! Now if they can just teach Sparky to pick grapes -- or do punch-downs. Don't tell Peta. Hurray for California's "bad" 2011 vintage!